Will rehabilitation of Stalin split Russian society? Nikolay Svanidze, head of the Human Rights Council (HRC) on civic engagement has said that the moral rehabilitation of Joseph Stalin in society just before the Victory Day parade could lead to an increase of radicalism in society and cause a split. However, not everybody shares this opinion. Statistics indicated that many Russians have a positive image of the Soviet leader. Speaking at a meeting of the Human Rights Council dealing with the growth of radicalism in society, Nikolay Svanidze expressed concern that, with the approach of Victory Day, efforts at the moral rehabilitation of Joseph Stalin would grow and could “lead to a division in public opinion”. Increasing talk about Stalin as the leader who brought victory for the Soviet Union over Nazi Germany has intensified before the celebration of the 70th anniversary of the event. 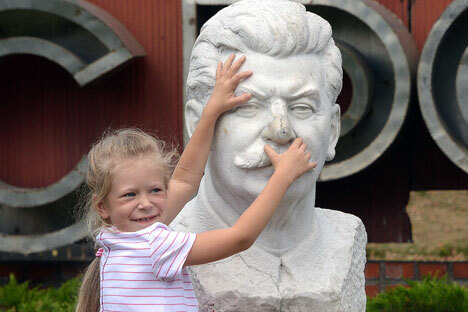 The Russian Communist Party has even drawn up plans to erect several monuments to Stalin, hang plaques and rename streets in Russian cities in his honour. One such proposal was to rename Volgograd into Stalingrad (again). Vadim Solovyev, State Duma deputy from the Communist Party, is convinced that all these steps are necessary to preserve the historical reality. “Stalin, as any ruler, is a controversial figure, but it is history, and we must talk about it and not forget it. People have been finally liberated of the lies and slander that surrounded the figure of the leader, and now give him credit,” he said. The presidential administration says that such decisions are within the authority of the provinces. In particular, in Orel (326 km south of Moscow), talks are on to erect such a monument. The head of the province is a Communist, so the administration doesn't oppose the project. Meanwhile, in Moscow, preparations are on to erect a monument honouring the victims of political repression. Ian Rachinsky, representative of the International Society ‘Memorial’, which works for the rehabilitation and restoration of justice for the repressed, agrees with Svanidze, and is convinced that the move to rehabilitate Stalin will lead to the split in society and give the impression that authorities are returning to the communist past. “The monuments would cause outrage among a large part of the population,” Rachinsky said. “I doubt that the authorities anywhere would be thoughtless enough to actually rehabilitate Stalin, with the exception of some Caucasian areas, perhaps, where there already are several monuments in his honour,” he told RIR. He is convinced that politically, such a move would strengthen the Communist Party. “The Communists have already governed the country for 70 years, it is doubtful they would be more effective today and would bring the country anything good. Also, the change of course would strengthen the position of the enthusiasts of past relics. As a consequence, all this may lead to the decay and degradation of the society,” Rachinsky is convinced. He said the rehabilitation of the former Soviet leader can even influence international assessments of Russia. “In many ways, it may strengthen the opinion that today's Russia is no different than Stalin's Soviet Union. It will only worsen the image of the country, especially in the already complicated relations with the West,” he concluded. Elena Shestopal, head of political psychology at the Moscow State University is convinced that Russian society will not face any serious contradictions because the majority of Russians support Stalinism. Political analysts believe that, despite the statistics, the authorities should not submit to the majority. “Following the opinion of the majority is not the most efficient behaviour. Generally, the authorities should hold their line,” she concluded. Alexey Grazhdankin, deputy director of ‘Levada Centre’, told Kommersant newspaper that the split within the “cultural elite” already exists, but the majority of Russians want to see a strong leader as the country’s head, and Stalin appears an appropriate example to them. “The broad masses are rather indifferent to Stalin. One shouldn't expect people to take to the streets to protest,” he said.